Protect your electronics with an 8 Outlet Surge Protector Power Strip from Power Gear. 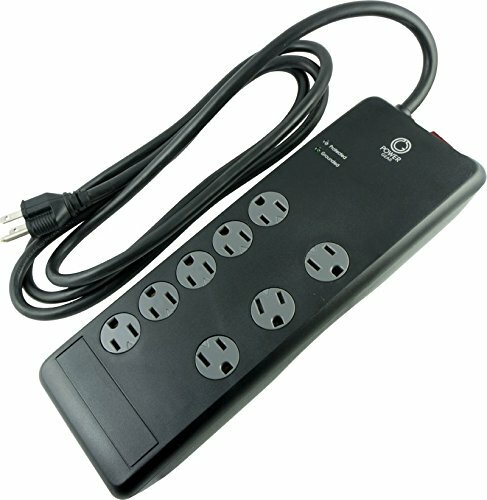 With superior protection for your home or office electronics, the advanced surge protector is equipped with eight protected outlets, including three adapter-spaced outlets, twist-to-lock safety covers and protection and grounded indicator lights, letting you know the protection components are working and properly grounded at a glance. The surge protector features automatic shutdown technology, permanently shutting down power to the outlets in the event of a dangerous power surge, and an integrated power filter to reduce interference and provide a cleaner sound and picture experience for older TVs (power interference does not affect newer TVs). Ensuring the protection of your electronics, the Power Gear Surge Protector comes with a 2100 Joules protection rating, $200,000 connected equipment guarantee and an extra-long seven-foot power cord. This 2100 Joule power strip is UL listed and is backed by a limited-lifetime warranty. If you have any questions about this product by Power Gear, contact us by completing and submitting the form below. If you are looking for a specif part number, please include it with your message.